Both Rob and his wife Jill were friendly, welcoming and great company. They are obviously very knowledgeable with many years' experience of birdwatching between them, and knew exactly where to look and to wait for our "target" species. We saw everything we set out to see but I guess we were lucky because nature is nature and doesn't always do what we want. We began the day at Lackford Lakes but also visited a number of other, different types of habitat during the day. Their enthusiasm was obvious and infectious but was also tempered with a deep respect for the birds and their welfare. My advice to others would be that if you want to give your self a great day out or would like to treat a friend or relative, visit Rob Wilson's website and book one of their packages. It' great value for money and you'll love it." 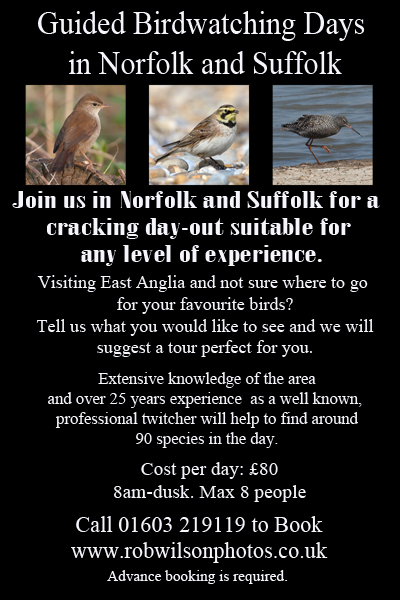 All tours are led by Rob who has a British list of 528 and 30 years experience as a bird watcher. All tours are flexible dependant on what is around, and therefore just give general ideas on sites to be visited. Most days will visit more than one site. Entry cost are not included. See below. Booking is essential, please call 01603 219119 to book. If you have received a voucher, please book as early as you can to get the most suitable date for you. We require min 4 people per day to run. We do have some binoculars to borrow for a small charge (to cover insurance) on a first come first served basis. Please ask when booking. We will have a Vortex telescope for all to try on the day as well. 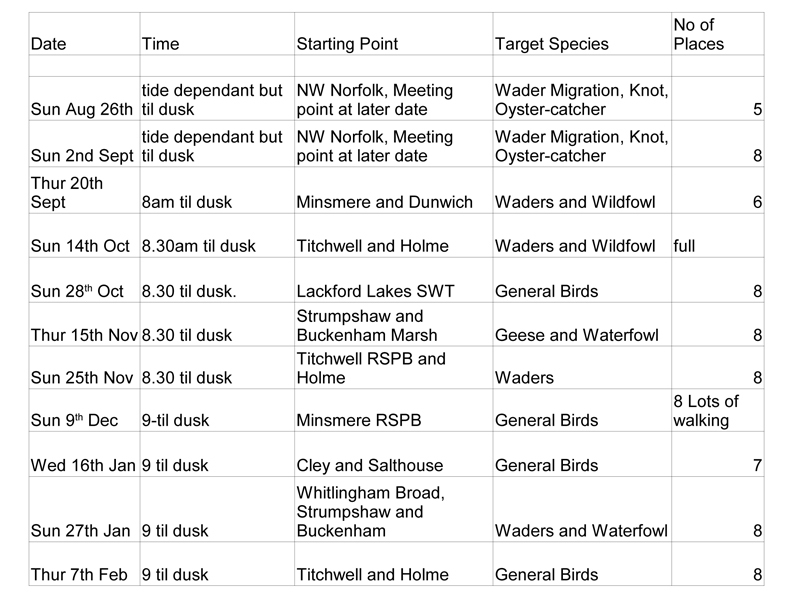 Own transport required as multiple sites are visited except for the minsmere days. Minsmere can be accessed by bus. If this is a problem we may be able to help by arranging a car share.